Limited number of the 2015 Register of Graduates available in the WPAOG Gift Shop! The West Point Register of Graduates & Former Cadets is WPAOG’s oldest publication, dating back to 1850, when the first Register was compiled by George W. Cullum, Class of 1833. An indispensable treasury of military history. Unique historic records and proprietary content, unavailable from any other publisher. Limited private edition available exclusively from West Point Association of Graduates. 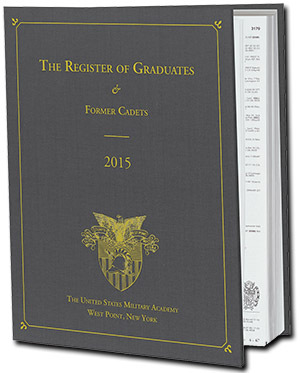 More than 1200 pages contain over 70,000 individual entries recording the names, classes and careers of every West Point graduate from 1802 to 2015. The Register of Graduates is a unique publication with roots that go back to 1846. At that time, as the 50th anniversary of the founding of the United States Military was approaching, a graduate of the Class of 1833 stationed at West Point, George W. Cullum, began to compile a listing of those who had attended the Military Academy. His first effort, published in 1850, was called a Register of the Officers and Graduates of the U.S. Military Academy from 1802 to January 1, 1850. Shortly afterwards, he took ill, and then duties elsewhere and the Civil War took priority. Returning to West Point in 1864 as superintendent, he served until 1866, when he was assigned other duties. In 1946, however, deeming it impractical to wait ten years to update the document, the West Point Alumni Foundation published its first annual Register of Graduates, setting the modern precedent. In 1972, this effort was transferred to the Association of Graduates and by 2002, the Bicentennial of the founding of the Academy, the Register was made available online, updated weekly, to graduates only.